What Is the Best Pool Deck Coating? A plain concrete pool deck isn't very attractive, and it can be hazardous, as well. Smooth concrete is a fairly slippery surface, and hot concrete baking in the sun can burn your feet. A variety of pool deck coatings are available to give your deck a high-quality appearance, and they work to protect your deck against water damage and rough patches that could hurt bare feet. There are even anti-slip coatings available. The best pool deck coatings last a long time, so you do not need to constantly reapply them. A concrete coating can mask imperfections in a concrete pool deck, protect its surface, and improve safety. When it comes to choosing a deck paint to use as a pool deck coating, acrylic paints provide the best option. Acrylic paints dry quickly, which minimizes the amount of time your pool is out of commission while the deck is being coated. Acrylic also keeps its color well, resisting fading caused by pool chemicals and UV rays. Although some of these products claim to fix cracks and flaws, it is best to patch bad areas and all but the smallest cracks before applying a concrete deck paint. Bare concrete surfaces require two coats, and coverage is between 80 and 120 square feet per gallon. You can expect to spend between $50 and $60 per gallon on a good concrete deck paint. A concrete overlay is essentially a very thin layer of additional concrete applied over the concrete pool deck to mask imperfections and change colors and textures. A variety of decorative finishing touches are possible with an overlay. Choose a concrete overlay that mixes cement and sand with polymer resins for a long-lasting finish that will resist fading. A micro-topping concrete overlay may be rolled onto the concrete in thin layers to add color or texture. Stamped concrete overlays work best when you want to add special patterns to the concrete around the pool. Very careful surface preparation is important with a concrete overlay. Dirty, oily, peeling or badly cracked concrete surfaces will not bond well with the overlay. Read label directions carefully for the preparation steps required for your product. Overlay products generally come in 40-pound bags of powder that are mixed with water to be applied. A bag covers about 50 square feet. Preparation and application is somewhat complicated, so pool owners often hire pros for this job. Epoxy paints and coatings work best on pool decks that have rough surfaces and areas that need repair. You may use an epoxy paint to fill in cracks and small holes on the pool deck. The paint also offers an easy-to-clean finish that does not fade from UV rays or exposure to pool chemicals. 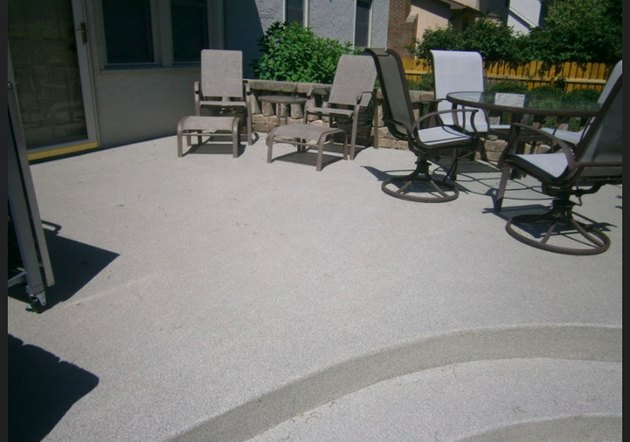 Epoxy coatings are often sold as "Concrete and Garage Paints," and there may also be decorative flakes you can add to give a more attractive, speckled appearance to your pool deck. Anti-slip coatings provide a simple way to coat a pool deck and may be used alone or along with another coating. Clear anti-slip coatings contain a small amount of texture in the form of polymer or mineral fragments to give them their anti-slip quality while retaining the look of the pool deck and protecting it from fading or damage from chemicals. Some of these products provide an anti-slip coating that may be mopped directly onto unsealed concrete or tile pool decks. Others can be sprayed onto any pool deck surface.